Marketing has changed, and marketers of the future will need to add a technological skill set to their creative talents if they want to take advantage of the opportunities digital marketing offers. That’s the conclusion of a new report from Mondo, a digital marketing and technology talent agency, that argues traditional marketing methods will no longer prevail in the digital era. 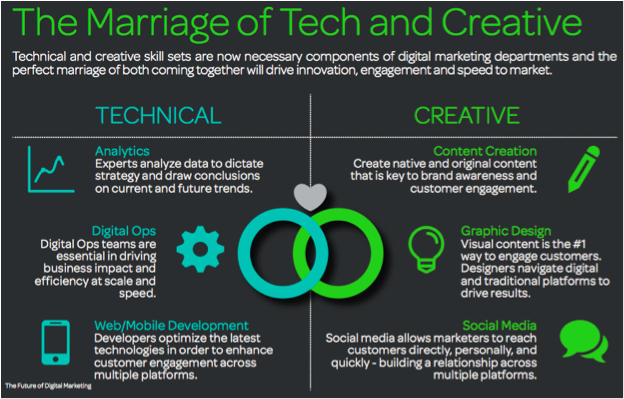 Instead, a complimentary marriage of technical and creative will be essential to continue to drive progress in the data rich, cross-channel environment marketers now operate in. “The Future of Digital Marketing Report” is a survey of more than 200 digital marketing influencers and executives, from drawing on the experiences of startups to Fortune 500 companies. Tapping those inside and outside the C-Suite, Mondo set out to discover how technology is affecting marketers of all stripes. An overwhelming 72 percent of respondents said traditional marketing is no longer enough — and nearly all of those surveyed (98 percent) think the role of the marketer will continue to move away from the traditional model. “The new digital era requires marketing departments to be more forward-thinking, prepare for the demand, and equip themselves with agile employees with the right skills,” said Laura McGarrity, VP of digital marketing strategy at Mondo. Finding new and innovative ways to break through all of the digital noise and reach consumers will be essential. Digital marketing departments are growing, with 80 percent of those surveyed indicating their digital marketing budget will increase over the next 12-18 months. The highest demand for hires over that period will likely be in the areas of digital and social, content creation, and data analysis. By 2016, it’s estimated that more than half of all new digital marketing hires will need to have a technical background. The survey also indicated the next three to five years will see a shift to a marketing team made up of an equal mix of permanent and freelance workers. Respondents cited the flexibility to turn resources on and off as needed, as well as access hard-to-find talent, as the main drivers toward hiring freelancers. I would add that mobility is also driving that trend, with remote workforces on the rise (raises hand! ), and the “work anywhere” mentality becoming mainstream. In the midst of such significant change, Mondo found customer engagement firmly in focus for the majority of marketing executives. Mobile marketing and video are earmarked as the greatest areas for growth. Perhaps more surprisingly, the survey indicated email marketing is likely to shrink somewhat. Colour me dubious, as I can’t see email going away anytime soon. Evolving? Sure. But not going away. 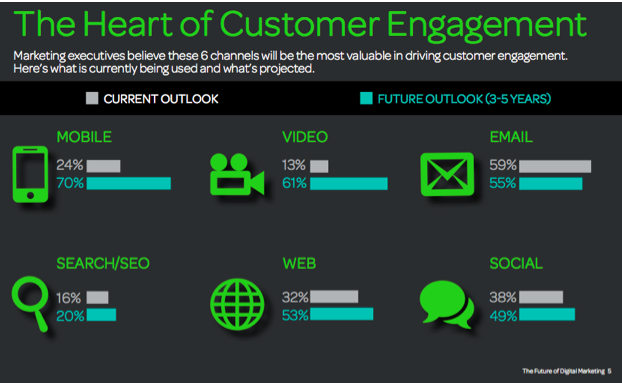 This graphic from the report illustrates the comparative projections for digital marketing across the six most popular channels. There are barriers to achieving the innovation needed, however. Three-quarters of those surveyed agreed marketing is becoming ever more important to the company as a whole, and that more needs to be done to align marketing with overall company objectives. In other words, departments must knock down those antiquated silos and start working together. The report concludes that the forward-thinking companies who embrace technology and creativity, and combine them to transform the way they engage with consumers, will be the winners. The rest are likely to be left behind in the digital race. Does this match your vision of the future of marketing, or do you think that good old traditional marketing methods can work in the digital age? I would love to hear your thoughts. You can learn more about the study by reading “The Future of Digital Marketing Report” (registration required) or by viewing the Slideshare presentation.